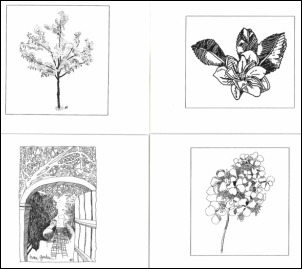 Delightful pen & ink illustrations of Gaiety Hollow! 4 cards per set at $10 each set, plus $1.25 postage & handling. Monograph 1 - This monograph is a reproduction of a series of nine articles written for the Oregonian in 1932. The focus is a discussion of their residential garden principles as applied to an urban lot. 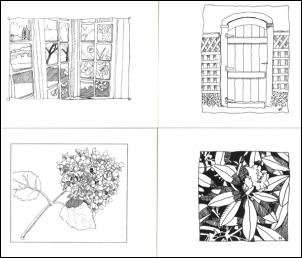 Beautifully illustrated with Edith Schryver’s pen and ink drawings, this reprint should be on the shelf of every gardener’s library! 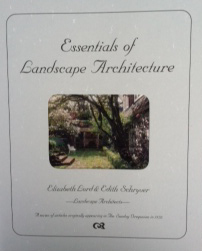 Monograph 2 - Elizabeth Lord and Edith Schryver Landscape Architects. 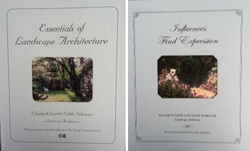 In response to local, regional and national interest in Lord and Schryver, this recent monograph details their formative years, design influences, professional life and legacy. Based on extensive original research, and illustrated with rare photographs, this informative history also includes a detailed guide to the plant combinations favored by these two pioneering garden designers. 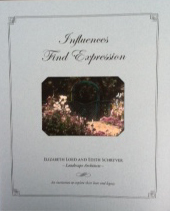 The Gardens of Lord and Schryver - Originally published in the Washington Park Arboretum Bulletin (Spring 2009) this reprint presents a distilled view of their lives and legacy and the Lord & Schryver Conservancy. 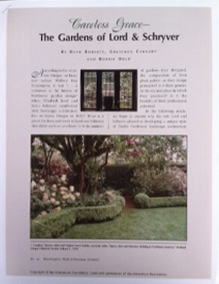 It is generously illustrated with color photographs of their home garden and other garden designs in Oregon, and it shows a detail of Schryver's watercolored plan for the Robertson garden. Enjoy this reprint of an outstanding article by Laurie Matthews about her work on the Cultural Landscape Report for the Gaiety Hollow property. First published in the Washington Arboretum.